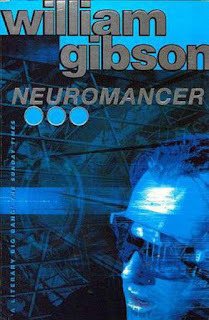 Neuromancer is one of those books that I have intended to read for some time, but just hadn't gotten to. It had gotten to the point where my sister was shocked that I hadn't actually read it yet, especially considering how much I like the whole cyberpunk aesthetic. So when I rediscovered where I had put the book, I couldn't really put it off any longer. Neuromancer follows Case, a former data-thief whose nervous system was burnt out by some former clients who he stole from. When he is approached by a mysterious employer who is willing to repair Case's nervous system in return for going back into the Matrix on a mission that could be more dangerous than anything he's attempted before. Soon it's apparent that the only ones he can trust are Molly, a mirror-eyed street samurai, and Flatline Dixie, an AI approximation of his old mentor. I'm still not quite sure how to feel about Neuromancer. On the one hand, it has all the atmosphere that I could possibly want in a cyberpunk novel. There is the weird kind of 1980s Blade-Runner-style idea of what the future would look like, which I like a lot more than I probably should. The plot is somewhat convoluted, but immersive nonetheless. And if you're willing to stick with some unfamiliar terms or are a big cyberpunk fan, then this is an obvious title to pick up. You'd pick it up regardless of my overall review really. As such, for those of you still on the fence, here are a couple things that you might want to consider before picking it up, in case they prove to be deal breakers. The first thing that really gave me pause for thought is that, as a protagonist, Case is surprisingly passive. After years of fiction in which the main driving force of a novel can be firmly placed with a handful of characters of which the protagonist is always withing that number, it's a real shock to the system to follow around someone who has more or less no say in where he goes or how he acts. Sure, he sometimes does the odd thing that his employers don't expect, but never anything major enough to throw a spanner in the overall plan. And I guess I can see why that decision was made, so that there was an appropriate sense of distrust and paranoia between him and his employers, but that understanding doesn't make the experience of reading Neuromancer any less jarring. The second issue I have is with the character of Peter Riviera. On top of being just generally unpleasant for no real reason, I still don't quite get why he is brought into the run. He's acknowledged to be a risk due to his perverse and psychopathic nature, but is brought onto the team to act as some poorly defined honey trap. I doubt that it was meant to be any kind of surprise when he betrays them, it just sticks out to me as an unnecessary risk in a plan that was supposed to have been set in motion by an incredibly intelligent and patient character.